Today (or rather tomorrow if Aunty Beeb hadnt gotten so excited) controversial Scottish brewery Brewdog make history once again with the release of the worlds strongest beer. Sink the Bismarck is 41% and £40 a bottle, and the price tag already seems to be putting some fellow bloggers off the trail. Its at this point where James must have thought 'we have bottles of Sink the Bismarck all over the place and I am dressed like a fool, what can I say?' After swearing a secrecy oath, all was revealed. I felt myself smiling from ear to ear. Mainly at the thought of the angry german brewers at Schorschbraeu who will now have to go back and try again. We talked for a while and after trying another top secret brew from the tanks James disapeared with my tasting glass and came back with a very interesting looking beer. Simply wonderful. There was no other first thought that popped into my head. Its very difficult to get really passionate about a beer when the two men who make it happen are sitting an arms length away from you but I just wanted to get up and dance about the room. It was perfect, bitter concentration with a healty dose of malt, sweetness and alcohol kick. THIS DOES NOT FEEL LIKE 41%.Its oh so very hoppy and as the title of the blog suggests, I like that! As much as I the love the pengiun, the Bismarck plows through the ice where the pengiuns struggle and slide about. This blows the penguin to Africa...who knows maybe even further. I ask people to stop talking about the age old Brewdog related question of publicity or good beer and actually get your hands on a bottle of this. If you cant justify buying one yourself, hey, chip in with half of your street. It is worth it I promise. Also this beer isnt mildly xenophobic or racist, its simply a bit of fun. If you can't laugh at it, dont buy it and go and watch a Michael McIntyre DVD or something. Dont start flinging up bits of wikipedia past, just accept it for what it is. Sink the Bismarck from BrewDog on Vimeo. P.s.s This is not an advert for Brewdog no matter how much it seems like one! Why is Georg "silly" for making a stronger beer in response to TNP? I don't see him throwing lazy anti-Scottish rubbish about. It wasnt intended to actually mean he is silly it is just a turn of phrase. You may call my writing style lazy but thats why I blog and I dont write pro! I didn't call your writing style lazy; I call the stereotypes lazy that BrewDog have unfortunately resorted to in naming this beer. It's what you expect from The Sun with their constant Kraut-bashing. What next? "We'll teach those deckchair-stealing bastards"? Here's why it's racist. Georg has no connection to the Third Reich, the Bismarck or the Second World War. He is being insulted solely on the basis of his nationality. Anyone should be able to understand that. An amusing rivalry between two brewers at the top of their game is fine. It's not a proxy war and it's not funny to try and turn it into one. And I do not think they have tried to. I would be interested to see Georgs response. I'd be very surprised if he took as much offence as many people seem to be. I think you have hit the nail on the head when you say an amusing rivalry. I do not honestly think this is meant as anything more. And appologies for the crossed wire before. Where did the notion that Schorsbock was a response to Tactical Nuclear Penguin come from? The lab report on it, published here, is dated 9th November -- weeks before TNP's launch. This isn't rivalry as there's only one side. Im sorry If I gave that impression in my blog. I never said it was in response! You can have a little one sided rivalry too. Sorry, the question was directed at Barm. Michael, you've had to tell us three times now that it's only a bit of fun. Do you reckon maybe it's time I sat back, relaxed, and had a good laugh at the deaths of 2,000 people? Im not asking you to laugh at anyones death far from it. Do you really think thats what the intention of making this was? Im not convinced it was. Some people can call it misguided. No I don't think that was the intention. But I don't think that's relevant. I'm just saying, in my opinion, it's not a bit of fun: it's in very poor taste. I'd say if BrewDog wanted people to concentrate on the beer they wouldn't have marketed it this way. I'll concentrate on the beer when I have the beer in front of me; right now all I can see is some pretty unpleasant advertising. That's all I'm in a position to comment on. Michael, you know where I stand on this after our facebook discussion. Im with The beer nut on this - it's in bad taste and all we can see is the advertising! I know where a lot of people stand on this one. I dont agree. I can see why they have called it this and if I were James I would stick by my decision. Then again Im a little biased. Beer Nut, my mistake. I didn't know Schorschbock 40% had been brewed and analysed before TNP was released. For what it's worth, I'll throw my 2c in. I think you're right, Michael, many Germans will find this amusing, and in terms of how that movie was produced, it does have some good parts. Although I suppose a German is unlikely to admit offence, as he'd just be accused of not having a sense of humour. I guess many people cry foul because they find it offensive on bahalf of the Germans, and yeah, while it may be a bit of fun, it is in bad taste. I think Jeff Pickthall put his finger on it in this post when he asked how would the British feel if a German brewery called a beer Sink the HMS Hood? I'm not British, but I can imagine the reaction. As far as it being a battle for the title, I disagree that it's an amusing rivalry. As far as I see it, Schorschbraeu were doing what they did, making strong beers, blithley ignorant of what BrewDog were doing. When TNP was launched I mailed Schorschbraeu as BrewDog had mentioned them as being the previous holder, and there was a better chance of me getting that locally than TNP. As you saw from the link TheBeerNut posted, they had already made their 39.x% beer tested and ready to go, so yeah, not competing. They didn't rush it out either, as it wasn't available for purchase till January, and even then it wasn't exactly with a fanfare. So, the chances that this small, possibly one-manned, German brewery was trying to beat TNP, as is insinuated in the movie, is unlikely. The comment from James on my blog, and other areas, made me think that it was BrewDog who were the ones having a whinge when news came out that this other brewer had a stronger beer. To be honest, the way the launch of STB has been approached merely confirms this, and that in actual fact BrewDog egos are far more delicate than I would have imagined. In a way, STB is represents the toys being thrown out of the pram. While lazy stereotyping can be amusing, at best, it's something I personally can't abide. Whether it's the Irish being called spud-thick Micks (I can't believe this still gets thrown about), the Scots being tight-fisted bastards (the Germans sometimes use a man in a kilt to advertise sales, that actually really pisses me off), the French being garlic-chewing surrender monkeys (oh, freedom fries! ), the Germans being sausage-munching lederhosen-wearing, humourless efficiency machines (the Bavarians are the ones with lederhosen, and they are German only after being Bavarian first and efficiency is a complete myth as my kitchen proves). I can't stand any of it, perhaps to the point of being irrational about it, so lets leave that be. Anyway, all that isn't what irks me most about this movie and little marketing campaign. While the movie and all the language being bandied about around this gives the impression that it's some sort of one-up-manship rivalry, which I think really got created in James' head, this may well become a self-fulfilling prophesy. Why? Because they made it personal. References to his father (even if all characters are purely finctional and any resemblance to people, living or dead, is purely coincidental), they take a cheap shot at him "selling his secrets" (maybe he was trying to reach out to do somehting together, and don't forget, English is not going to be his first language) and then "Gay-org". And why? Becasue the guy had the nerve to brew a beer that dented the BrewDog ego. So, no, I don't think Georg will find it amusing. I do think you're feeding it my using phrases like "designed to knock the smile of the face of the silly brewer at Schorschbraeu" and "Mainly at the thought of the angry german brewers at Schorschbraeu who will now have to go back and try again". Unless, of course, there's something else behind this, and we're all being played, again. Your right in many ways there is a lot about this whole situation that we just do not know. We do not really know Georgs intention with the email but if taken the way it seems, it does seem a little strange for a brewer to do this. I do think it seems to be mostly non-germans getting offended on behalf of Germans though! 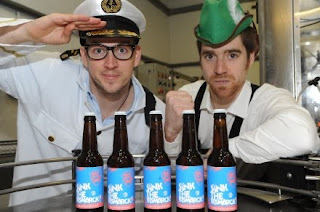 Its all about creating discussion and that is what Brewdog and James want. I haven't looked at BA, but will have a gander for the full story. Don't worry about me, I'm not offended by the "silly" or "angry" remarks. I can understand that after a trip to the brewery and having tasted it you're gonna be caught up in the excitement, and your choice of words probably reflect the atmosphere in there. The above are just my own observations/opinions having chewed it over during the evening playing Lego. Although my German is crap, I'll keep an eye on the German beer forums (such as they are) to see if I can gauge a general reaction. Haha yeah that would be good to hear actually. An evening playing Lego? I wont ask! Yeah a lot of the words in the article were written very early this morning when I realised that my extra day to write the article had been stolen by a man at the BBC who published the press release today by accident. Ok, read the BA stuff, but have to say I don't really get "self-deprecating" from the vid. "Schorschbrau also riled us for 2 reasons. When we launched Penguin they tried to steal the show with a beer which they may launch, someday somewhere in the future. We had a beer on the market and they had something they were going to make. Secondly they contacted us and tried to sell (yes sell!) us their secrets of brewing high ABV beers. Consequently we wanted to playfully poke a bit of fun at them". I thought it was clear that they already had this beer, tested, ready to go, so not exactly trying to steal the show. On my blog, James commented that Schorschbraeu was due to launch in January, like he already knew about it. And they did launch it in January, right? Sure, it's definitely cool to have a world record. It's definitely great to have the craic, go crazy, do what you love doing and entertain the masses while doing so. When you peel back the layers, no, I don't think this particular one was a playful poke at this guy. Kinda feels more like playground bullies, getting all the other kids on their side while making fun of the fat kid, if that makes sense? Meh!